I have always loved the clean lines, and dapper, yet completely chic look of tuxedos. Unfortunately, I can’t say that I necessarily fancy the menswear look on women. There is a solution, however. Both Silence & Noise and Betsey Johnson have released the most darling tribute to tuxedos – for females! They are feminine and dainty; lacy and silky; and, my personal favorite, quite kind to the wallet. In all of my twenty-something years, I have never worn a halter top, but this fabulous little Silence & Noise Tuxedo Halter Dress has made me eager to change that. The button top is not only preppy and classy, but trendy and rocker-esque if worn for a night out on the town. And the sheer black lace overlay? It makes me weak in the knees. At $59.99, I can’t help but think that this sassy frock would make for the perfect investment! I’m so used to Betsey Johnson adding little splashes of pink into each and every one of her designs, so when I spotted this Color Block Jumper Dress, I was shocked to see that it was simple, sweet, and...black and white. The almost-off the shoulder top is delicate (and reminds me slightly of the getups those German Beer Maids pop up wearing during Oktoberfest); but it’s the suspenders and babydoll-like appearance that really catch my eye. I would love to have both of these tuxedo-inspired dresses peeking out of my closet; but since I can only have one, I’ll go with…you tell me! Which is your favorite? Finding the perfect evening clutch is akin to finding a needle in a haystack – nearly impossible. But I have found a breathtaking one. A usable one. A fashionable one. And…best of all, an affordable one. The IMAN Global Chic Vintage Bow Clutch is the evening bag that launched a thousand ensemble possibilities. Faux metallic snakeskin that is shimmery and spectacular; ruched detail trim that brings out a bow-like silhouette (which Blair Waldorf would love! ); and a rhinestone brooch that adds a little glitz to your glamour. I have it in black and couldn’t be more thrilled. Sure, it’s compact, and provides only enough room for your evening essentials – lip gloss, cell phone, credit card. But it’s elegant. It’s chic. It’s trendy. Let’s face it, it’s P-E-R-F-E-C-T. I may just have to invest in a second color, only which one? The bronze? The purple? The red? The platinum? The gold? Which one is your favorite? Thanks to HSN for the picture. I’m kind of in love with Kate Spade. Almost every accessory with her name on it is irresistible to me. Case in point, these Tortuga Bay Fish Earrings. Not only do they tickle my fishy fancy, but they are also perfect for all of those summer-based holidays – Memorial Day, Labor Day, 4th of July – making them an essential piece of your summer wardrobe, and versatile enough for year-round wear. 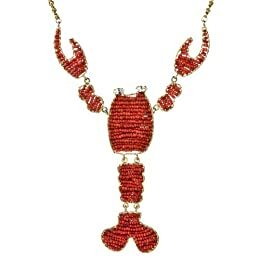 I have seen many necklaces over the years, but never have I seen one as creative as this Erickson Beamon for Target Red Seed Bead Lobster Pendant Necklace. The lobster’s body is made out of red seed beads that make him appear so lifelike, and his faux diamond eyes stare out at the world in the most charming yet adorable way. What I love even more is the deconstructed body, that wiggles in every which way when you walk. This necklace embodies the three F’s – fun, fabulous, and oh so fashionable! Have you ever gone to the beach for a relaxing day spent shoreside, gossip magazine in hand, and face-framing sunglasses perched atop your perky nose, when all of a sudden people scatter due to an octopus sighting? Somehow I don’t think that Ollie’s CZ Octopus Cocktail Ring will have that same affect on people. 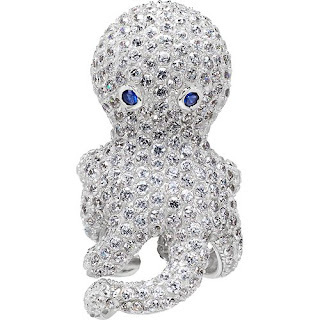 In fact, I think that his charming blue eyes and adorable little body will lure people in to admire your under-the-sea inspired rhinestone-adorned finger. When I was four-years-old I took baths alongside an Ariel (from The Little Mermaid) doll who really swam in water. Eventually her hair became a tangled mess, she would instantly sink when submerged in water, and we tossed her out with the garbage, but I never forgot about her. 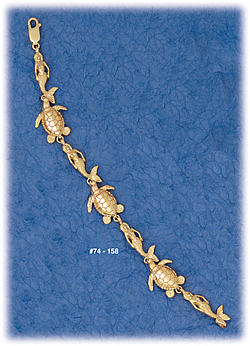 This Mermaids and Turtles Bracelet brings back memories of the happy times I shared with Ariel, but also reaffirms my belief that mermaids do exist! Are seahorses real? For some reason, I have always viewed seahorses as mythical creatures. Real or not, I’m completely in love with them. They are charming and sweet, and possess such a serene nature that I can’t so much as attempt to ignore. 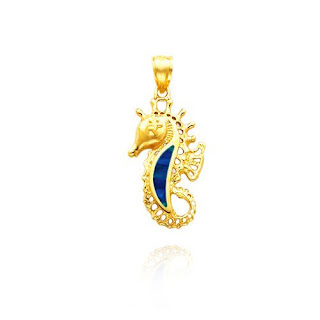 Which is why, if I were to create a charm bracelet all my own, the first thing I would buy is this 14K Yellow Gold Created Opal Detailed Seahorse Pendant. From his turned-down snout to his lifelike cutouts, he is adorable through and through with a whimsical nature that is simply charming. Thanks to Kate Spade, Target, Emitations, Nautical Jewelry, and Golden Jewelry Store for the pictures. Geek love in the form of a book. A headband made for romance. Scrummy muffins in a can. Wedge sandals that are pink, perky, and absolutely perfect! An elegant hiding place for your teeny tiny treasures. Thanks to Little Boat for the picture. I'm not a big fan of the color yellow, but I can't help but adore this room. The color is so perky and bright and instantly makes me think of warm summer days at the beach, eating ice cream on the boardwalk, and window shopping wearing nothing but flippy sundresses and espadrilles. In a room like this you simply can't help but be happy! Thanks to Point Click Home for the picture. Blame it on my current reading of Marion Meade’s Bobbed Hair and Bathtub Gin: Writers Running Wild in the Twenties, or my years-long obsession with Fitzgerald’s Daisy Buchanan, but I am currently obsessed with the fashion of the twenties. Namely, the cloche hat. The cloche hat, with its wide brim and bell shape is both sophisticated and romantic, and the most darling choice of headwear for the warmer months. Which is why I am in dire need of one. Stat! Why is it that whenever I’m searching for an item that fits my current whim I am able to locate it at Forever 21? 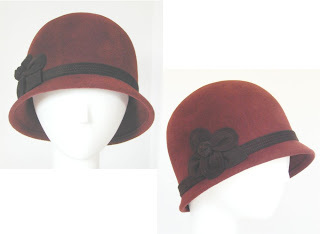 The cloche hat is no different. Their Amelia Wool Cloche has become one of my daily internet visitations. 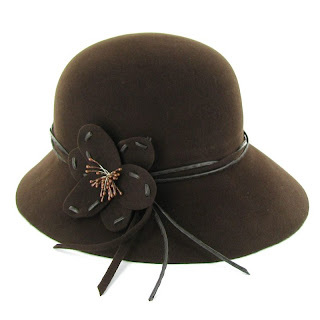 The brown felt, tied with a demure black velour ribbon with bow is just too adorable for words. The mere sight of this hat alone leaves me breathless. I could most certainly see this magnificent headwear looking perfect paired with a broach-adorned capelet. Oh how I want it! Flowers and floral designs and prints are one of the most popular trends for the spring and summer so, of course, I had to contain my happy squeals when I spotted this Callanan Alina Floral Banded Cloche. The chocolate backdrop is scrumptiously decadent, and the little splash of color added by the felt flower, adorned with contrasting stitching, is, to put it bluntly, practically perfect in every way. If you ask me, rhinestones and jewels have the ability to make just about anything a little bit more fabulous – including hats. This Billabong Flapper Hat is no exception. At first, you may think it’s your typical black cloche; but at second glance you can see two divine details: a grosgrain ribbon, and a multi-colored jeweled broach that just happens to be removable. It’s like two treats in one, plus, the whole package is so much fun! I’ve never been a huge fan of straw hats, but even I can’t deny the easy, breezy, beautiful look they add to just about any outfit. They have such a carefree spirit to them which makes me want to cast all cares to the wind and just prance around merrily. 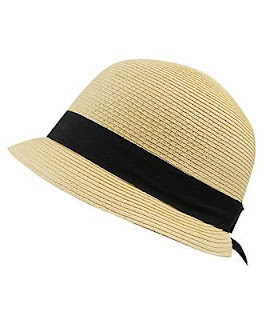 Maybe I’ll do just that in this adorable Straw Cloche Hat. The color is perfectly lovely, but it’s the contrasting black grosgrain ribbon and bow that work together in making me fantasize about an afternoon spent lounging away on a picnic blanket, lemonade in one hand, a classic paperback in the other. My only question now is whether or not I have the appropriate hairstyle to pull off a cloche. 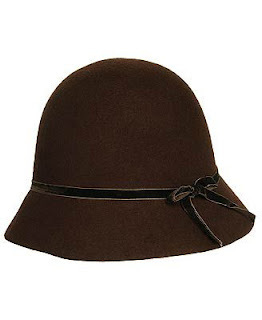 Cloche hats seem like they were made for the bob, or cute crops that are pixie-like and ethereal. I have neither. Instead my hair (which I adore, and take great pride in) is waist-length and home to eyebrow-length bangs, very bohemian/seventies hippie. Should I try pairing a cloche with that ‘do, or simply admire the retro headgear from afar? Thanks to Forever 21, Couture Creations, and Surfing Waves for the pictures. I’m in the market for a statement necklace. Something big, bold, fun. Something like this Spring Bliss Necklace. It has all the makings of the ideal statement necklace – bright colors, fun themes, and perfect for dressing up or dressing down. From the big cutout butterflies, to the flowers that seemingly bloom right before your eyes. It’s like a garden party around your neck! Thanks to Forever 21 for the picture. Clothes do so much for us. 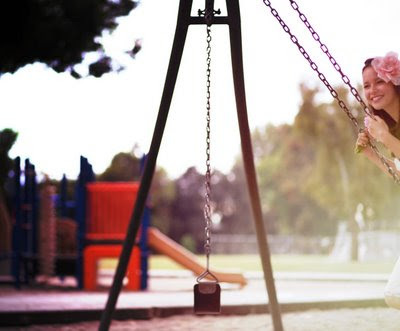 They mold our personalities; allow us to let our funny, sweet, cheerful, angry, sassy...side shine through; and give us the chance to be unique. That said, I have come to the conclusion that sometimes, we just have to hug our clothes. Okay, I don’t mean you should actually open up your closet, grab hold of a beloved dress, and squeeze it tightly; I mean that we should hug our clothes via Huggable Hangers! As an HSN addict, I have seen thousands of products cross the screen, but none as fun as these Huggable Hangers. They are covered in velvet, have chrome hooks, and are both petite and sweet. I have them in a chocolate color, which I love, but I want a set of pink ones because – hello! – pink is the greatest color to ever appear on the planet! But, aside from the texture and the colors, there is an added bonus for all of us shopaholics...these Huggable Hangers manage to not only keep clothes in perfect order (mine have been wrinkle free! ), but they compact your clothes so that you have more closet space, making it a necessity to run out and buy more clothes – after all, there’s no reason to waste all that extra room in your closet. I don’t know about you, but I’m off to hug my clothes right now! Thanks to Apartment Therapy, and HSN for the pictures. I’m well-aware of the fact that Betsey Johnson is full of clever – and often wacky – design ideas; but even I couldn’t imagine her coming up with something as kitschy as the Betseyville Call Me Purse. The pink leopard print patent vinyl is adorable on its own; but it’s the detachable black toy phone (with faux cord), along with the dial design that adorns the front of the bag that puts it in a league of its own. This is something that I could totally see Barbie toting about on her dates with Ken, but it’s also perfect for the rest of us because: a) It’s small enough to be thought of as a clutch, making it the perfect tagalong for girls night out; b) The colors can easily be paired with just about anything in your closet; c) It’s tres unique, fashioning the perfect conversation piece. This is one purse you’ll be phoning your friends about. Glamour is my new favorite magazine. Why, you ask? This photo shoot. Everything about the "American Icons" editorial is downright fabulous – from the females of the past they chose to feature, all the way to the female celebrities of today whom they used to depict these historical greats. This is one of those amazing finds that you don’t see everyday, but can’t seem to get enough of. What a fantastically fashion-inspired way to end the weekend! Camilla Belle as Mary Tyler Moore. Mary Tyler Moore was like the Carrie Bradshaw of the 70s, sans the closet full of Manolo Blahniks, apartment in New York City, and constant search for the perfect guy. She was a career woman with great friends, and an even greater wardrobe full of retro wrapdresses and flared pants. Which is why Camilla Belle is the ideal person to portray her. Camilla has a wardrobe that most of us would love to call our own, plus she is the face of Vera Wang's Princess fragrance. Basically, she has it all. Including a pink coat (pictured at right) that reminds me so much of Legally Blonde. Did you know that there's an actual bronze statue of Mary Tyler Moore in Minneapolis? Emma Roberts as Audrey Hepburn. I honestly feel that Audrey's role in Breakfast at Tiffany's clinched her inclusion on this list, and for good reason - it was one of the most elegant, chic, posh films of the 1900's. Plus, Audrey was undeniably beautiful in a very simple, sophisticated way - much like Emma Roberts. This is possibly one of my favorite pictures on earth because: a) A bouquet of pink balloons are present; b) That black dress is one of the most amazing things I have ever seen; c) The backdrop reminds me of the secret garden. Alexis Bledel as Rosie the Riveter. Up until this morning, I had no idea who Rosie the Riveter was, even though I have seen - and adored - her picture since I was a toddler in saddle shoes. I do, however, know who Alexis Bledel is. In fact, I fancy myself to be Alexis Bledel, or, rather, her character on Gilmore Girls, minus the admission to Yale, rebellious boyfriends, trust fund, and assortment of school uniforms. This picture somewhat reminds me of one of those retro glamour girl pin-ups, just a tad more rough and tumble. Did you know who Rosie the Riveter was? Emma Stone as Carrie Bradshaw. I do not know who Emma Stone is, but she may just be my new favorite person, thanks to her depiction of everyone's favorite Manolo-wearing, Cosmo-sipping Carrie Bradshaw. Carrie Bradshaw is the girl that we all aspire to be, with her nameplate necklaces, fabulous headwear, handful of debonair boyfriends who slip in and out of her life on a weekly basis, and life in New York City. She is the fashionista of our dreams. I so want to be her. Two people I think were missing from this list include That Girl (who on the planet didn't want to be That Girl when they were growing up? ), and Marilyn Monroe. If you could revise this list, who would you add and/or remove from it? Thanks to Glamour for the pictures. I can’t tell whether it’s the fact that the weather has suddenly gotten warmer, making it a necessity to cast my much-beloved chilly weather wear to the depths of my closet, or the realization that my Spring Break is quickly slipping away, and that the return to homework is fast approaching. No matter the cause, I have a case of the “moodies” that I just can’t shake. Luckily I have these things to keep a smile – even if it is, at times, a fake one – in place. Books about Writers Running Wild in the Twenties. An assortment of picnic baskets to fit every mood, season, or personality. The ideal skirt for a spring, or summer, fling. Cupcake making kits with the power to bring out the amateur baker in all of us! Affordable and adorable cocktail rings. A guide to the perfect girls' night in. Socks fit for a wannabe ballerina. Thanks to Apartment # 34 for the picture. Do you remember how when you landed your first job, you rushed out to buy some stuffy, all-black business-type outfit, pulled your hair back into a sharp bun, and slipped your feet into scuffed loafers swiped from your mother’s closet? The end result was something between someone who possessed little to no fashion sense, and Super Nanny. Who says you have to wave goodbye to your fashionista side when you join the workforce? All you have to do is incorporate some chic bits and pieces into your wardrobe to keep your inner slave-to-fashion alive and kicking. Over the years, I have seen people pull some of the ugliest business card holders from their pockets. Things that were worn-out, weather-beaten, and embarrassing to so much as look at, let alone own. This Couture Card Holder is nothing like that. 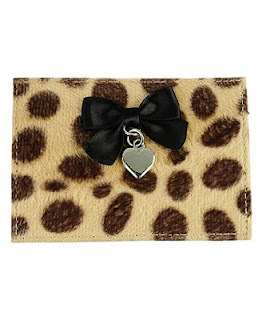 The fuzzy leopard print, adorned with a black satin bow and silver heart charm make for a cute way for your wild child to stand out front and center. And, even more adorable? As opposed to your typical rectangular window, your cards can peek out at you through a clear heart-shaped pocket. What’s not to love about that? 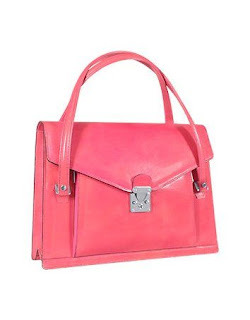 Elle Woods is a huge fashion inspiration to me, which is why I instantly thought of her when I saw this pink L.A.P.A. Double Gusset Women’s Briefcase. It’s the perfect way to let your perky, vibrant side show through – even if you’re dressed in a tacky uniform. Let’s face it, office supply stores are not very fashion-conscious, so their selection of day planners? Well, they’re usually lacking some…oomph. This IMAN Global Chic 2009 Jeweled Fashion Day Planner, however, manages to make up for that and then some. The gold color is perfect for those of us currently surfing the metallic craze; and the different sized topaz rhinestone jewels adorning the cover? To put it bluntly, they’re squeal-worthy! How can you possibly be a proper working girl without a sophisticated watch wrapped around your wrist, making it simple for you to count down the minutes until you’re released from your daily prison? 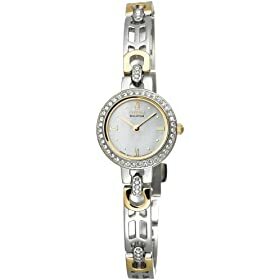 This Citizen Women’s Eco-Drive Silhouette Crystal Accented Gold-Tone Watch is elegant and beautiful. But the real kicker? It doesn’t run on batteries. Instead, it gets charged up via sunlight or with the assistance of a lamp. Blair Waldorf may get away with wearing tights of any color – be it neon or neutral. Us working class individuals? Not so much. But, just because we’re relegated to donning flat, uninteresting colors doesn’t mean that we can’t, in the words of Emeril Lagasse, “kick it up a notch.” These Two Tone Diamond Crochet Tights are the perfect way to let your individuality stand out in the workplace, without breaking the rules. Thanks to Forever 21, Forzieri, HSN, Amazon, and Urban Outfitters for the pictures. I was three-years-old the first time I asked for a dog. Here we are, over fifteen-years later, and do I have a pup of my own? No. I suppose that’s the consequence of being the proud parent of three very finicky yet lovable kitty cats. Still, having a rambunctious little puppy to curl up with at night would be my ultimate dream. But, since it’s not likely to happen anytime soon, I suppose I’ll have to settle for one of these Pet In A Basket necklaces from Shop Hullabaloo. Bear the beagle (the necklace pictured above) is my absolute favorite; closely followed by Cody (a little golden retriever), and the seven other canine selections (Max, Buddy, Jake, Rocky, Bailey, Buster, and Charlie). Each puppy rests in a basket that hangs from a 24” chain that adds enough childlike innocence to your wardrobe to make you howl in delight. I want all nine! Thanks to Shop Hullabaloo for the picture. Have you ever found a painting that spoke to you from first sight, leading you to believe that you couldn't live without it? The other day while I was browsing through Target, I was plagued by such a feeling. Now, take into consideration the fact that I wasn't even looking for a piece of art; I just happened to stumble into the framed picture area, and, lo and behold....perfection. There, staring back at me, was Andrea Laliberte's London, a part of her Shopping in the City collection, which features other chic fashion meccas such as Rome, Paris, and New York. Let's just say I snatched up that painting without a moment's thought, and am now eagerly searching for the other three in the hopes of having the whole collection by the end of the month. Shopping in the City is a metropolitan-dwelling, shopaholic fashionista's dream; and Andrea Laliberte? Well, as the creator of such beauty, she is the queen, plain and simple. Thanks to Bare Walls for the pictures. Perhaps the only thing more decadent than great clothes is hot coffee and gossip magazines. Which is why Dsquared2's Fall 2009 Ready-to-Wear Collection has spoken to me like no other. Instead of sending their leggy models down the runway decked out only in the latest trends, they added an extra touch that managed to speak to the inner caffeine-addicted, celebrity-loving fashionista in everyone by slipping coffee cups and gossip magazines into their cocktail ring-encrusted hands. It's a pairing that no one in their right mind could ignore. Thanks to Style for the picture. It's hip to be square"
Huey Lewis & the News, "Hip to Be Square"
I've been the victim of one too many unexpected pinches over the years due to the fact that I typically forget St. Patrick's Day. Not this year! I refuse to suffer at the hands of those who have the good sense to remember the leprechaun-loving day just so they can wreak havoc upon those who have more important things on their mind. Thus, my selections for staying safe on St. Patrick's Day. I typically opt for metallic-colored headbands when I make my selections for hair-adornments; but this Mini Crystal Centered Flower Headband from bebe is calling out to me. The color is reminiscent of fresh grown grass, and the little flower looks so much like a four-leaf clover that I can't help but think of finding a pot of gold at the end of the rainbow simply by wearing this lovely piece of hair perfection. Shift dresses are, perhaps, the most adorable addition to the dress family. One, they are extremely versatile, looking perfect paired with tights, leggings, or bare legs; two, they possess such an effortless, playful look to their structure; and three, they seem to look good on every body type. So you can imagine my pleasure at spotting this Geren Ford Kelly Green Silk Rivet Detail Mini Dress. The color is breathtaking. The material is a dream. And the cut is spectacular. I'll take two please! Big handbags are my favorite. I like knowing that I can toss anything from books to barrettes, and iPod's to eyeliner into their fashionable depths. 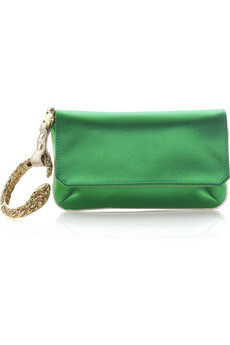 But even I was enthralled at the discovery of this Roberto Cavalli Serpent Bracelet Clutch. The emerald color is to-die-for; but the thing that truly speaks to me is the fact that the typical cloth-created wristlet is replaced by a gold serpent-inspired cuff that doubles as an oh-so-chic bracelet. Flouncy skirts make the heart grow fonder; and this kelly green Thick-Knit Jersey Skirt from American Apparel is no exception. The raw edges and elastic waistband make it a perfectly adorable and trendy way to spend a lazy Sunday afternoon paired with a beat-up sweatshirt, or paint the town red by pairing it with a rhinestone-encrusted tank fit for a queen. And the best part? At just $19 each, it doesn't break the bank. Skinny jeans are like a way of life. Without them, I don't know how anyone could survive. While I typically rock dark wash denim skinnies, I can't help but love these Kelly Green Super Skinny T-Jeans from Tripp NYC. The color is mind-blowingly spectacular, and would look amazing dressed up or dressed down with just about anything in your closet. All I can say is...gimme, gimme, gimme! Thanks to bebe, Bluefly, Net-A-Porter, American Apparel, and Tripp NYC for the pictures. Every time I’m about to get a break from school I come up with all sorts of elaborate ideas for how I will spend my homework-free days; but once the break finally arrives, I’m lucky if I can even find the strength or energy to get out of bed, let alone hit the road. Not to worry, these things have helped to keep my week fabulous and fresh from start to finish! Adorable kits that make me want to learn how to sew. A compact mirror that brings the Roaring Twenties to the depths of your handbag. Reruns of the greatest reality show on earth. Table dress forms perfect for hanging your most precious baubles from. Self-serve yogurt shops that bring out the kid in me. Mad Hatter inspired top hat headbands. Mixing bowl sets that make it simple to add a dash of love to all of your meals. Yummy bandages that are cute enough to eat, but perfect for healing wounds. Thanks to Corrie Bond Photographer for the picture. My love affair with owls began in August of 2006, when Paul & Joe released a Plaid Owl Bag as part of their GO! International Collection for Target. Here we are two-and-a-half years later, and I’m still infatuated with the nocturnal animals, and constantly looking to add bits and pieces of them into my everyday life – and wardrobe. For over six months I have searched high and low for an owl pendant necklace that was equal parts wearable, adorable, and unique. Finally, my search has ended. The Kenneth Jay Lane Owl Necklace is the absolute perfect neck accessory. 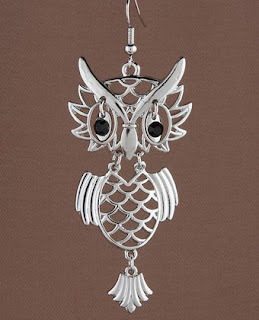 The owl pendant is 2-inches wide, and features white, gold, and red colors; but the best part is that there are little blue and green rhinestones that construct his eyes. Plus, the chain is 24-inches long which absolutely thrills me because…long necklaces are my favorite! Finding the perfect purse is hard work. There are certain requirements that it has to fill before you truly decide to take the plunge and invest even the tiniest amount in. 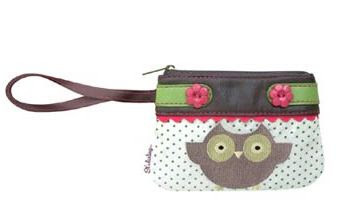 When it involves a purse adorned with pink beaded flowers, polka dots, and a wide-eyed owl, like this Darling Owl Purse, however, all requirements go out the window, and you simply shell out the cash. After all, how often do you find a purse as sweet and whimsical as this? I’ve always been a stud person. Mainly because I fear that I’ll snag my earring on a sweater, and do some sort of irreparable damage to my earlobe. But even I can’t resist these Night Owl Earrings in Silver. The two-and-a-half-inch owl is undeniably cute, and sports black rhinestone eyes on a bed of silver that pop in the sunlight. What I adore is the fact that the owl comes in three pieces that are attached to one another via little clasps, so when you walk – or dance – the owl looks like he’s coming to life with every step you take. I absolutely refuse to leave the house without some sort of headband or barrette peeking through my light brown hair; it’s just against my way of thinking. So you can just imagine the joy that overcame me when I spotted these Three Owls Hair Clips. The silver-toned bobby pin, adorned with the one-inch trio of antique-washed owls give your style a vintage, no-fuss look. 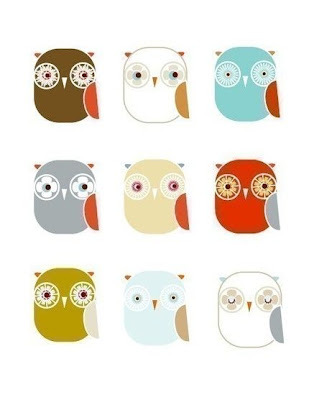 These are the perfect find that I can’t help but hoot about! 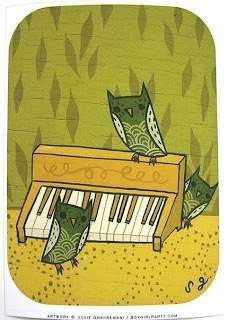 As much as I love the chic look of black and white prints, sometimes a splash of color is a welcome treat, and Susie Ghahremani’s Organ Owls, is full of retro colors that can truly dress up a stark white wall. Ghahremani’s childlike hand is like a breath of fresh air – one that has captured my owl-loving heart, and a place on my bedroom wall. Have you ever put something on your wish list and left it there untouched for months on end? Well, I’m currently guilty of such a crime. 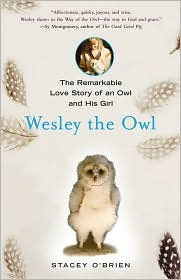 Wesley the Owl: The Remarkable Love Story of an Owl and His Girl by Stacey O’Brien has been sitting on my Amazon wish list since...November 11, 2008. 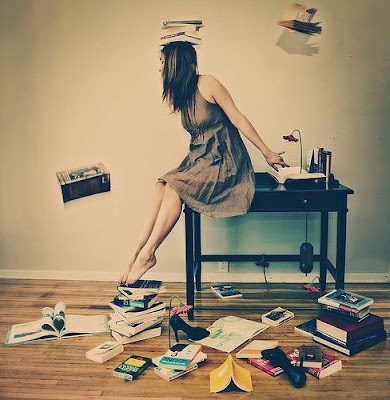 Maybe, since I’m in a very bookish mood at the moment, now is the time to give it a whirl. Thanks to Etsy, ShopBop, ShanaLogic, and Sunrise Direct for the pictures. I haven’t been on a vacation since I was wearing overalls, and hobnobbing with Donald, Daisy, Mickey, Goofy, and just about any other Disney character you can imagine. So do you think it’s wrong that I am suffering from an incredible urge to spend countless amounts of cash on luggage that will, most likely, end up collecting dust in my on-the-verge-of-bursting closet? Neither do I. Luggage is an essential part of life. It’s a necessity. A must-have. A can’t-live-without. After all, what on earth would you do if you were suddenly offered the chance to indulge in a vacation of a lifetime, but you had a mere 60 minutes to not only pack, but catch a plane as well; and you were luggage-less? Me? I would curl up in a ball and die just thinking about such an amazing missed opportunity. Which is why I am preparing myself for future unexpected travel and fulfilling my luggage lust all at the same time via my new love: SteamLine Luggage. Personally I see the name SteamLine Luggage as a tribute to one of the greatest love stories of all time – Titanic. Just looking at the vintage stylings of these romantically fashionable – and useful – items makes me think of the lovely Rose DeWitt Bukater, and the passion she felt for Jack Dawson (Leonardo DiCaprio’s character). They are old-fashioned and regal, and, the absolute kicker, available in six different collections that feature the most enchanting names – The Aviator Series, The Editor Series, The Ambassador Series, The Executive Series, The Explorer Series, and The Producer Series. Each piece is more charming than the last, but my absolute favorite collection would have to be The Editor Series – and not just because the name brings to mind glossy magazines, football-field size fashion closets with tons of free goodies, and How to Lose a Guy in 10 Days-like staff meetings. No, instead it is the color, the whimsy, the stowaway like styles that leave me breathless. From the enchanting pink handles and straps, to the classic cream canvas. These are the types of pieces that Daisy Buchanan would have been seen towing about as she boarded steamships and trains on her way to visit all sorts of exotic locales. The items that Becky Bloomwood blew all of her rent money on. The accessories that accompanied the classic film stars of the forties from set to set. These are also the things that will make me feel like a starlet myself as I cruise to paradise in a red hot roadster, scarf tied loosely about my head a la Audrey Hepburn in Roman Holiday. I realize that I've fallen victim to both greed and lust in this post; but when it involves luggage this irresistible, I simply can't help myself! Thanks to Seeking Designers for the pictures.